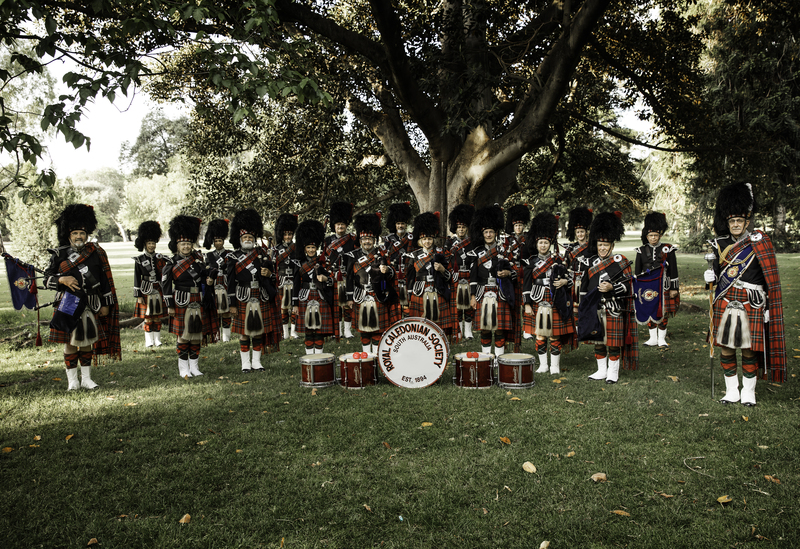 What started out over a hundred years ago in the City of Adelaide as “The Pipers Band” is now commonly acknowledged as one of the most recognised Pipe Bands in South Australia and the oldest civilian Pipe Band in the Southern Hemisphere. It is furthermore believed, to be the second oldest civilian Pipe Band in the world. The first public appearance occurred on May the 5th, 1894 at the unveiling of the Robert Burns statue on North Terrace, Adelaide, South Australia and later that evening the event was celebrated with a “Grand Promenade Concert” at the Exhibition Hall where the band, consisting of 10 pipers and 5 drummers played 2 brackets of music under the leadership of Pipe Major James Balloch. 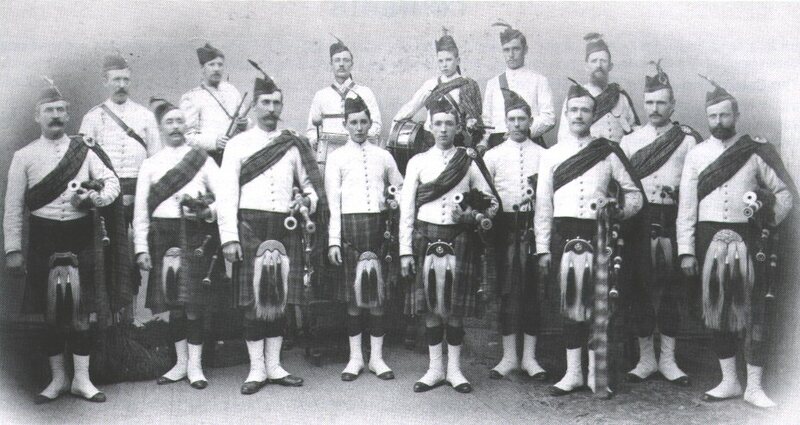 1894, November 11th – The Piper’s Band appeared for the first time in their Gordon’s 92nd Highland tartan and white collar tunics at the first “Continental Pipers Band Festival”. 1900 – The Piper’s Band became part of the Scottish Rifle Corps of South Australia, which was formed as a response to the Boer War in South Africa. 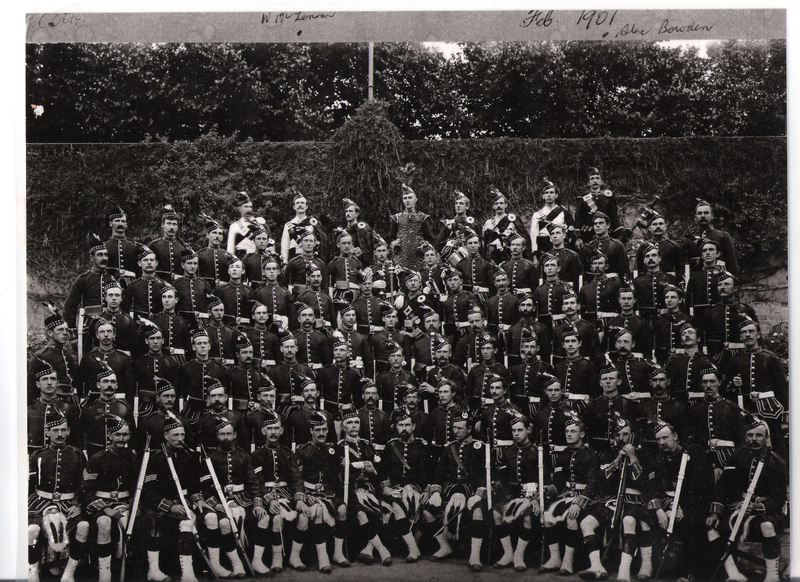 1912 – The Scottish Rifle Corps was disbanded in 1912 and the Band became known as The Caledonian Pipe Band. 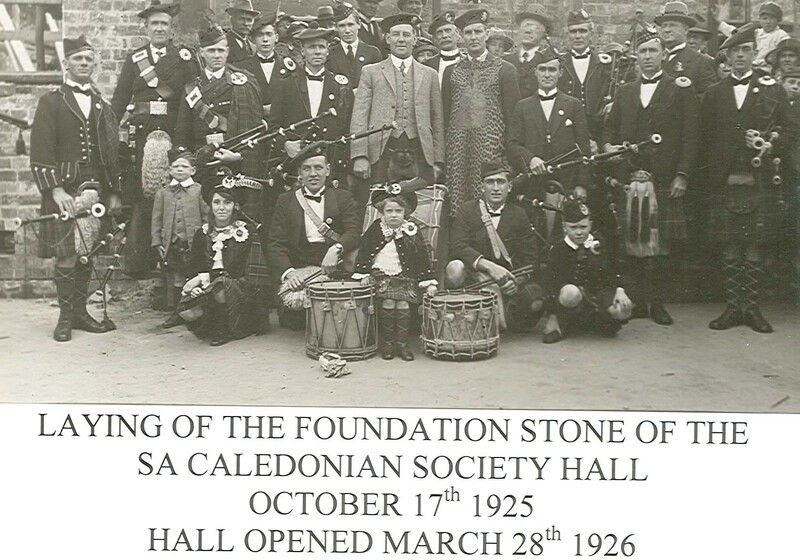 1925 – Foundation stone of The South Australian Caledonian Society hall at King William Street, Adelaide was layed. 1927 – The Highland Pipe Band amalgamated with The Caledonian Pipe Band. 1929 – The Caledonian Pipe Band adopted the McGregor tartan. 1936 – The Caledonian Pipe Band in competition with the best bands in Australia, won the A Grade Quickstep and took out second prize on the A Grade Selection. 1937 – The South Australian 27nd Battalion became a kilted regiment with many Scottish recruits. The Caledonian Pipe Band became part of the 2/27th Battalion and played at the recruiting campaign parades. A number of members joined the Battalion and it’s band. Dan McGregor, who was Pipe Sergeant of The Caledonian Pipe Band joined the 27th Battalion and became Pipe Major of the Battalion’s Pipe Band. Other member who served in the 27th Battalion during WWII were A. Fleetwood, J. Fleetwood and J. Mitchell. 1938 – The Caledonian Pipe Band competed in their first interstate competition in Sydney, coming first in the Quickstep and second in the Open Selection. 1939 – Outbreak of WWII. Among the first to enlist was Pipe Sergeant Dan McGregor who was appointed Pipe Major of the 27th Battalion and tenor drummer J. Ashton, who joined the 2/10th Battalion and became their Drum Major of the Regimental Brass Band. Pipers Angus Thomson and Ken Grierson went overseas with the 2/3rd Field Ambulance along with J. McDonald Smith, J. McCance, A. Fleetwood, J. Fleetwood and J. Mitchell also from the band. 1942 – 1945 During this time The Caledonian Pipe Band were approached by the Australian Defence Department and ask to assist in establishing another Army Pipe Band for the Australian Women’s Army Service. Pipe Major Bill Niven instructed 10 pipers whilst Drum Sergeant Duff instructed 12 drummers. 1946 – King George VI granted permission to the Caledonian Society to use the prefix ‘Royal’ in recognition and mainly due to the untiring efforts and devoted services of the Society’s Pipe Band members. Many served during the Boer War, World War I, and with numerous receiving decorations for their part in conflicts during World War II. From that point the Band became known, as they are today, as The Pipes and Drums of The Royal Caledonian Society of South Australia. 1948 The Adelaide University Regiment was established and formed their own pipe band with the help of The Pipes and Drums of the Royal Caledonian Society’s Pipe Major Bill Niven, who was their original pipe tutor. Some members of The Pipes and Drums of the Royal Caledonian Society left the band and joined The Adelaide University Regiment Pipe Band these included, bass drummer Paul Ritchie and piper Jock Sutherland. 1951 – Pipe Major Niven’s final year as Pipe Major. 1952 – Earnest Dowler was appointed Pipe Major. The band consisted of a Drum Major, 12 pipers, 7 drummers, 5 learner drummers and 18 learner pipers. 1955 – 1957 The Pipes and Drums of The Royal Caledonian Society went to Mount Gambier to compete, winning the Legion cup three years in a row in the Quickstep and Street March. 1964 – 1967 Robert Pattullo was Pipe Major. 1970 – Vern Raymond became Pipe Major. 1982 – the first female, Wendy Gangell joined the band. Feather bonnets issued to the drummers. 1984 – competed in Daylesford, Victoria coming First in Grade 2. 1985 – competed at the South Australian Championships and were First in Grade 2. 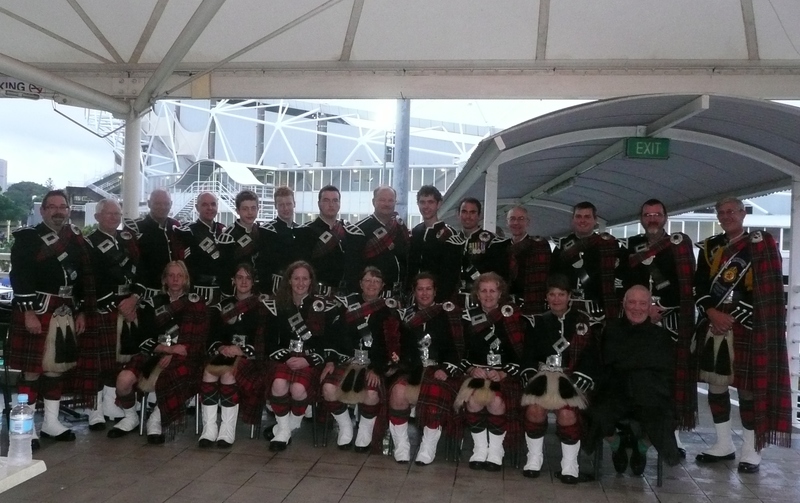 1986 – competed at the Australian Pipe Band Championships in Adelaide, winning to become the Grade 2 Australian Champions. 1987 – Feather bonnets issued to the pipers. 2001 – The highlight for the Band was the invitation to perform at the internationally famous Edinburgh Military Tattoo in Scotland. 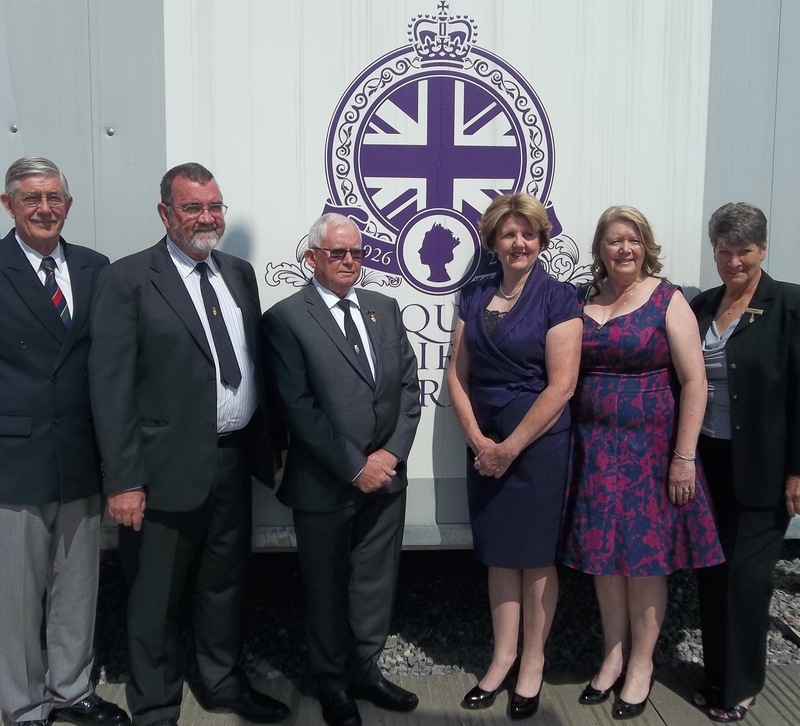 Band members worked hard for two years fundraising for replacement uniforms and equipment to enable the Band to maintain their high standard when they represented Australia and performed at this prestigious event. Pipe Major at this time was Robert (Bob) McGregor. 2005 – February the Band again proudly represented the State of South Australia at the International Edinburgh Military Tattoo “A Tribute to Australia”. This was only the second time in history that the International Edinburgh Tattoo has travelled outside of Scotland. It was hosted at ‘Aussie Stadium’ in Sydney to capacity crowds. Pipe Major at the time was Hamilton (Hamy) Marcelin. 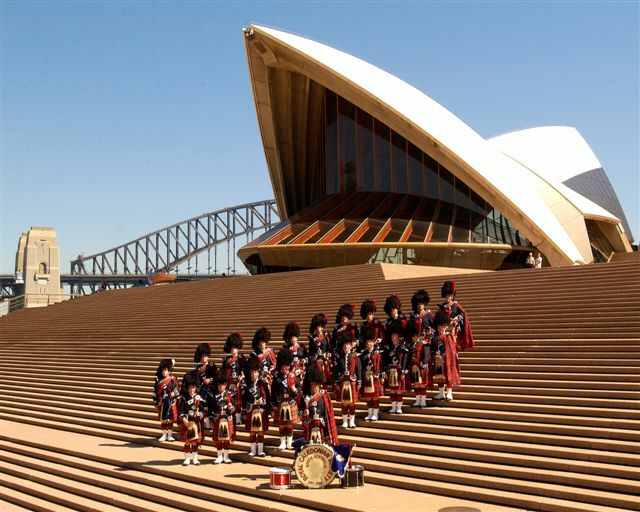 The Pipes and Drums of The Royal Caledonian Society at the Sydney Opera House. 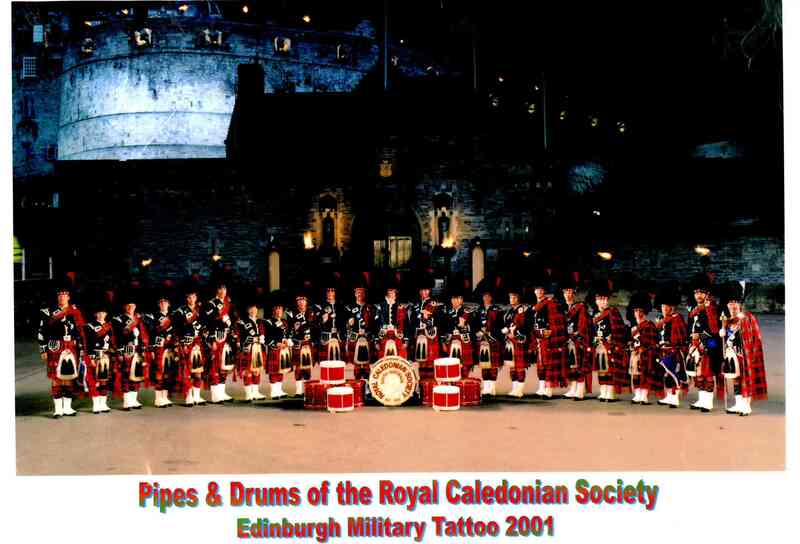 The above photograph is The Pipes and Drums of The Royal Caledonian Society of South Australia at the Edinburgh Military Tattoo “A Tribute to Australia” held at Aussie Stadium, Sydney Australia in 2005 with a reproduction of Edinburgh Castle in the background. 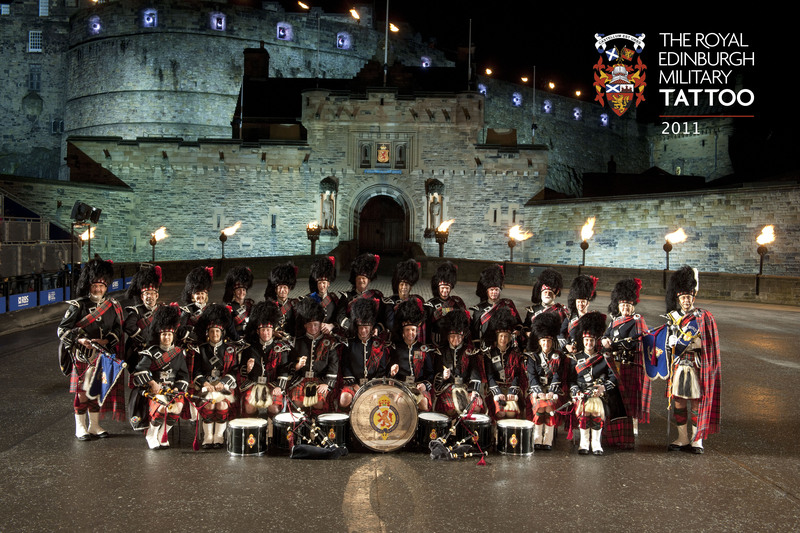 2007 – The band once again had the honour of representing South Australia at The Edinburgh Military Tattoo in Scotland. Pipe Major at the time was Dan Meehan. Their official Tattoo photo shown was taken on ANZAC Day (25 April, 2007) at the monument to Col. William Light, the founder of Adelaide, in Light Square in the City of Adelaide. After an uneventful flight to Edinburgh, the Band spent the first few days in rehearsals on the parade ground at Redford Barracks, pri- marily to ensure that all the bands taking part knew the formations that they would be performing. There were also two full dress rehearsals at the Edinburgh Castle. Rehearsals on the parade ground at Redford Army Barracks in Edinburgh. 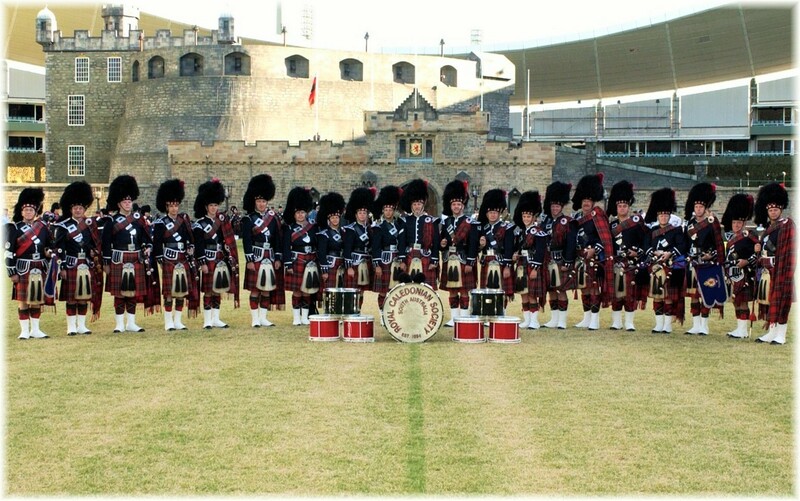 2010 – The Pipes and Drums of the Royal Caledonian Society of South Australia again played at the Edinburgh Military Tattoo “A Tribute to Australia” held at Aussie Stadium, Sydney Australia in 2010. Pipe Major at the time was Dan Meehan. 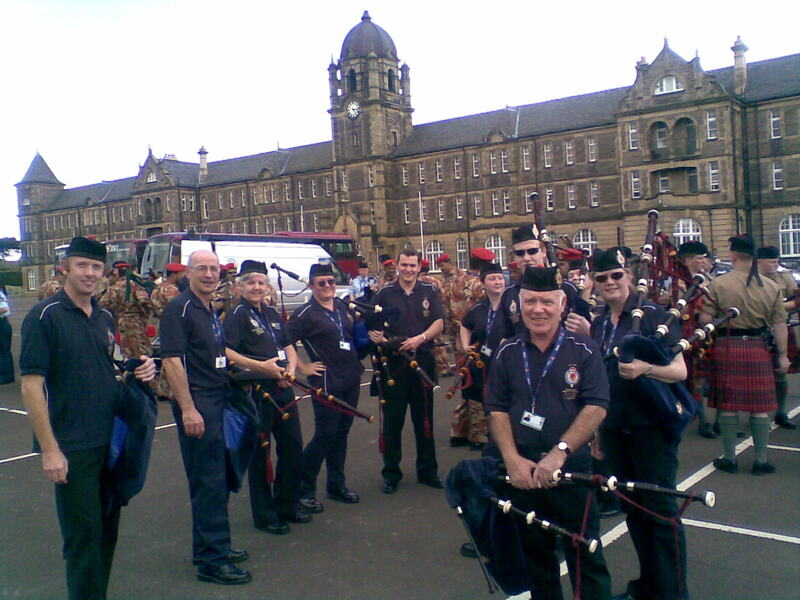 2011 – And again The Pipes and Drums of the Royal Caledonian Society of South Australia were invited to play at the now named “Royal Edinburgh Military Tattoo” in Scotland. Pipe Major at the time was Dan Meehan. On the esplanade at Edinburgh Castle. 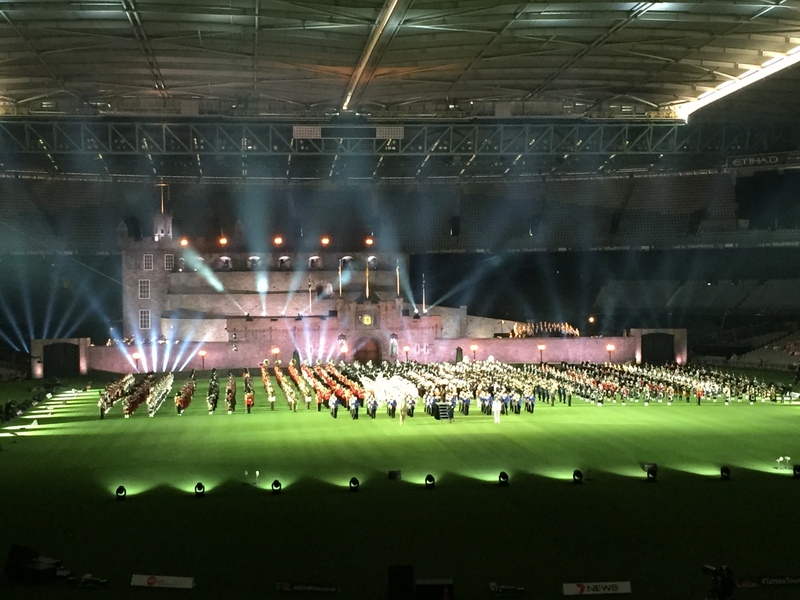 2013 – The Pipes and Drums of the Royal Caledonian Society of South Australia played in the Switzerland Tattoo held in Basel. Pipe Major at the time was Dan Meehan. 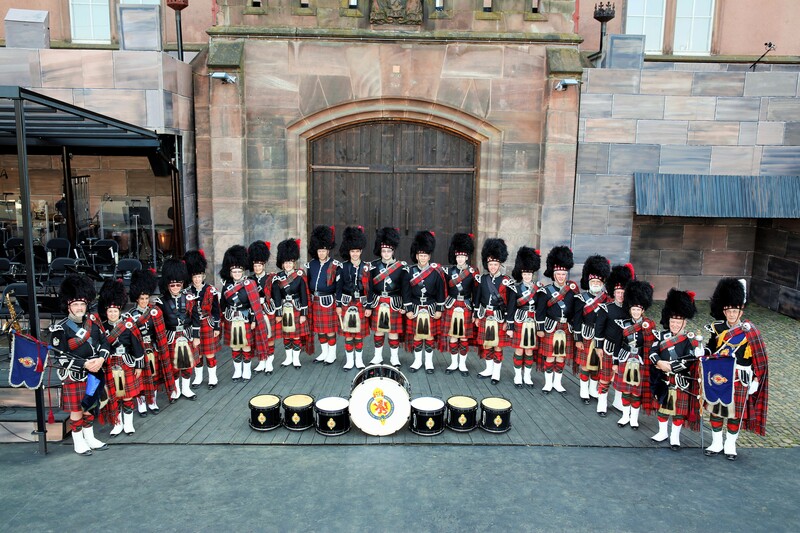 2016 – February – Official photo (below) of the band in preparation for The Royal Edinburgh Military Tattoo – which took place on the 13th, 14th & 15th of February 2016 at Etihad Stadium, Melbourne, Victoria, Australia. 2016 – May 12th,13th,14th & 15th – Her Majesty The Queen’s 90th Birthday Celebrations – Windsor Castle, England. 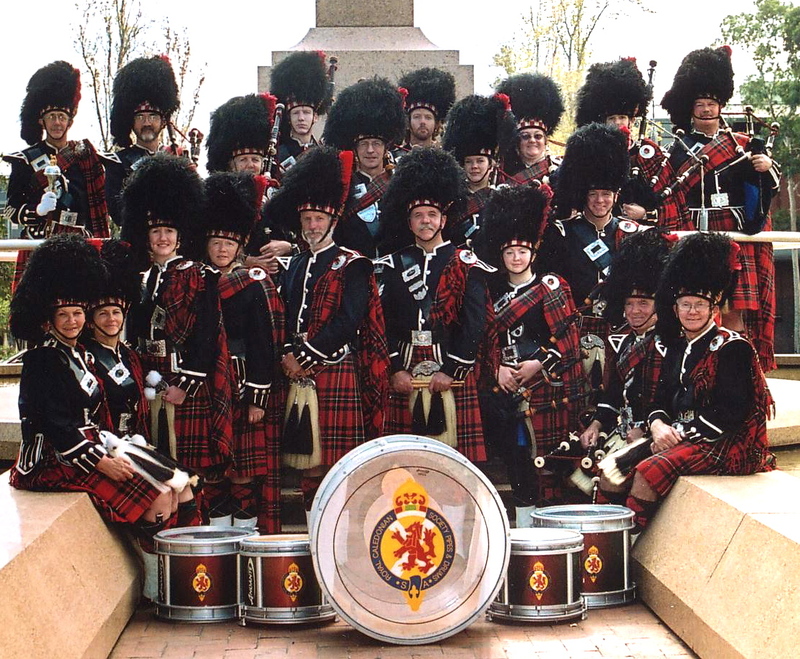 The Pipes & Drums of The Royal Caledonian Society of South Australia were part of a massed band with other bands such as The Royal Scots Dragoon Guards, The Royal Air Force, The Royal Irish Regiment, The Irish Guards and The Capetown Highlanders. Band Members who attended Afternoon Tea with The Queen. Kym Atwell, Dan Meehan, Bob Moffatt, Cath McKenna, Heather Pennell and Jeannette Macdonald. 2017 – 14th June, Reception at Government House Adelaide in honour of The Queen’s 91st Birthday. 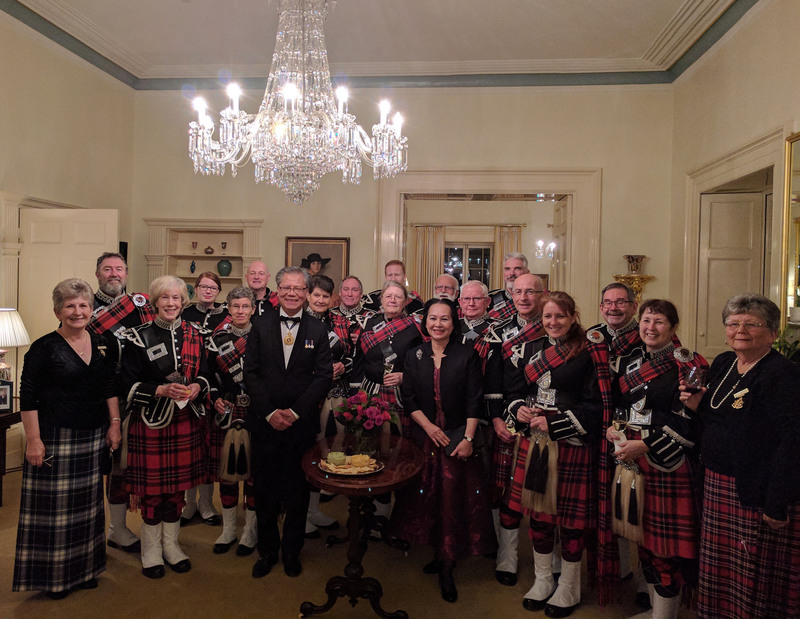 His Excellency the Honourable Hieu Van Le AC and Mrs Lan T. Phuong Le with the Pipes & Drums of The Royal Caledonian Society of South Australia far left is Society Secretary Christina Cockerill and far right is the Chief of The Royal Caledonian Society of South Australia, Ann Wickham. 2018 – May – Dan Meehan has stood down from the roll as Pipe Major. Dan was Pipe Major from 2006 – 2018 leading the Band to 3 Edinburgh Tattoos, 2 Australian Edinburgh Tattoos, 1 Basel Tattoo, The Queen’s 90th Birthday celebration at Windsor Castle and many other local engagements. I will pass on your email to Dan.